Exactly how loud is that jackhammer? When a jackhammer starts pounding outside your window at 7 o’clock on a Monday morning, you might find it annoying. For the worker who is running that jackhammer, however, the sounds are more than annoying – without proper hearing protection, they can be dangerous. Occupational hearing loss is the most common work-related illness in the U.S. Each year, 22 million workers are exposed to hazardous noise, according to the National Institute for Occupational Safety and Health (NIOSH), which does research for the U.S. Centers for Disease Control and Prevention (CDC). The first step toward protecting workers from occupational hearing loss is knowing how loud those sounds really are. The U.S. Department of Labor’s Occupational Safety and Health Administration (OSHA) does regular assessments to identify hazardous noise levels. But the equipment that OSHA uses has to be calibrated periodically, to make sure that it is performing correctly. The National Institute of Standards and Technology (NIST) recently calibrated one of OSHA’s standard microphones, a procedure that NIST has completed regularly, since the 1970s, for a group of standard microphones belonging to OSHA. These calibrated microphones are in turn used by OSHA to calibrate nearly ten thousand pieces of OSHA’s own equipment, which includes sound level meters and noise dosimeters used to monitor sounds in the workplace as well as acoustical calibrators used to calibrate the sound level meters in the field. 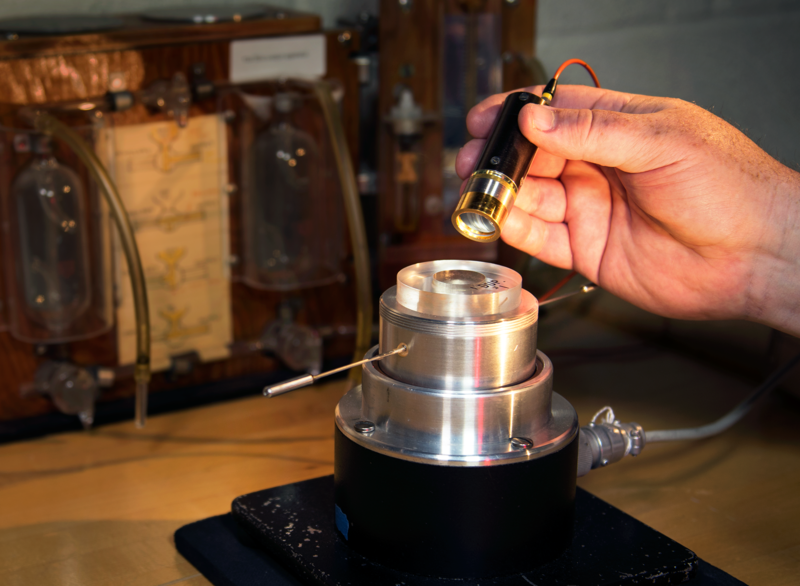 To perform the calibration for OSHA, NIST scientists measured the mic’s sensitivity through comparison to NIST standard microphones that have already been calibrated. Sound is pressure waves traveling through a medium such as air. A microphone is a device that takes those pressure waves and turns them into an electrical signal – a voltage. To calibrate a microphone, researchers need to measure how sensitive it is to those pressure waves. The same sound will cause a more sensitive microphone to produce a bigger voltage signal than a less sensitive microphone under the same conditions. The set-up used for the OSHA microphone calibrations. The transmitter microphone is the gold-colored cylinder at the tip of the shaft being held in this photo. The receiver microphone is inside the metal base. The metal-and-transparent-plastic donut is the acoustic coupler, which connects the two microphones. The two long thin arms projecting from either side of the coupler are narrow tubes that ensure the air pressure inside the coupler is the same as the air pressure outside the coupler. The wooden panel and tubes in the background are part of a device that helps fill and keep hydrogen inside the coupler, for tests at higher frequencies that require hydrogen to be the sound medium instead of air. Standard microphones like the ones NIST uses for the OSHA calibrations are special. 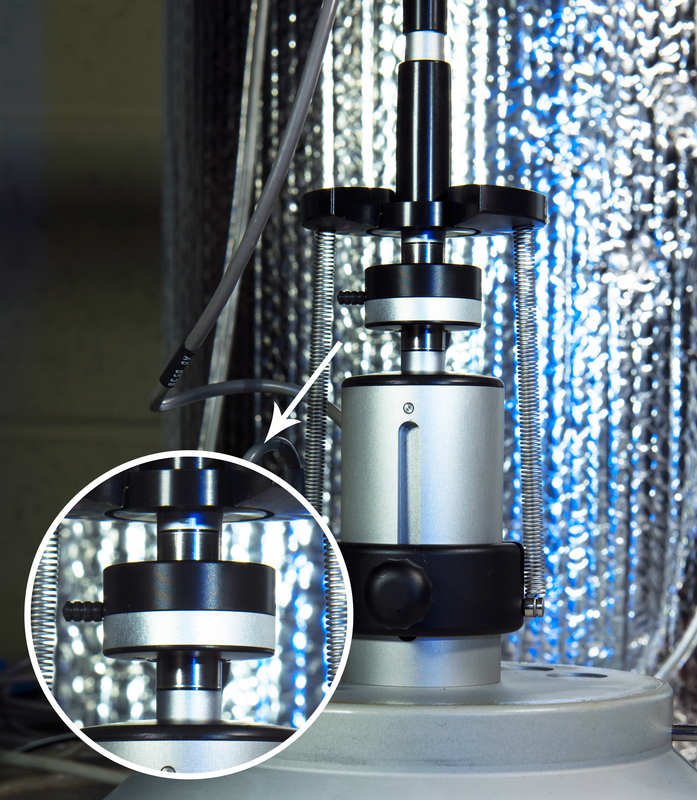 Unlike the mics you might use for a conference call or karaoke night, these NIST standard microphones are able to perform in the calibration as either a receiver or as a transmitter – essentially a loudspeaker. After a measurement has been taken, the microphones’ positions can be swapped, with the transmitter acting as receiver and vice versa. This process is repeated several times, using a total of three standard microphones. By exchanging the mics’ roles between measurements, researchers can be sure of the sensitivity of each of the three microphones without the need for a previously calibrated microphone. Another set-up for calibrating microphone sensitivity. Here, the acoustic coupler is the small, stout, two-toned (black and silver) cylinder in the middle of the inset at bottom left. The two microphones are the narrower metallic cylinders directly above and below the coupler. In this set-up, the transmitting microphone is on the bottom, while the receiving microphone is on top. Once the standard mics are calibrated by reciprocity, they can be used to calibrate an OSHA microphone by what NIST’s Randy Wagner calls a “reciprocity-based comparison.” In this case, the OSHA mic being calibrated is only used as a receiver, while each NIST standard mic is only used as a transmitter. During a calibration, NIST scientists use their standard mics to play pure tones over a wide range of audible frequencies. Through a chain of calibrations, the measurements performed at NIST can ensure the performance of OSHA field instruments that measure workplace noise levels created by everything from a contractor’s pile driver to a barista’s espresso machine. * Technically, scientists are measuring the ratio of the input voltage used to drive the transmitter mic and the voltage coming out of the receiver mic. ** Instead of air, sometimes another gas, such as hydrogen, is used. ***Among other things, the coupler is designed to ensure that the pressure waves traveling through the air provide an approximately uniform pressure distribution across the surface of the receiver mic. **** In acoustics, the decibel (dB) is a unit of sound pressure level that is used to express the relative amplitude of a sound. Its scale is logarithmic to accommodate the large dynamic range of sound that humans can hear. It is also used as a unit of sensitivity level for a microphone, in which case it expresses the ratio between two quantities: the microphone sensitivity (in volts per pascal) and a reference sensitivity (1 volt per pascal).